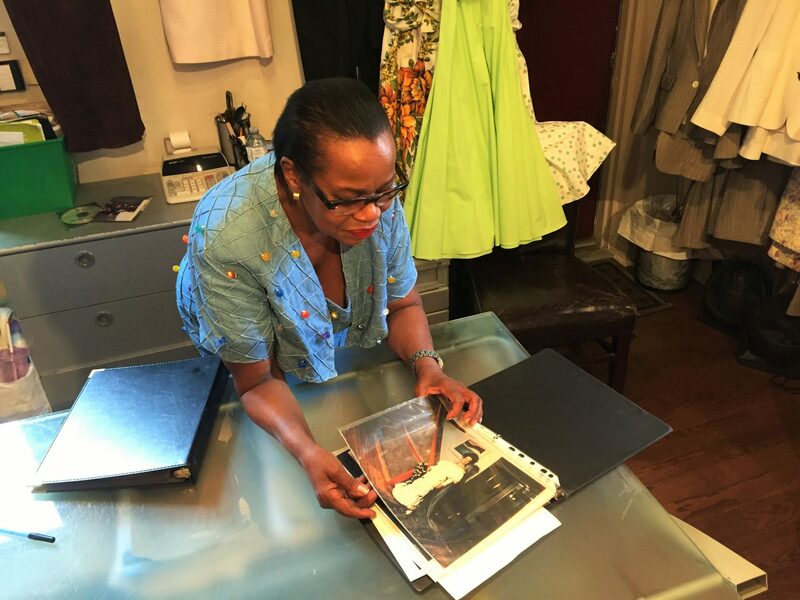 Pearl with her photo collection: dresses and clients from over the years. My real mission is to see Pearl’s workshop in the basement of her current location—13 Charles Street—and understand her creative process. She makes all of the garments from scratch, using her own designs. She leads me down the narrow staircase from the shop floor to show me where the clothes are made. She has three people working downstairs at the moment: one woman who travels in part time to help with the sewing, another at the cutting table setting out pattern pieces, and a third person working with the fabric. 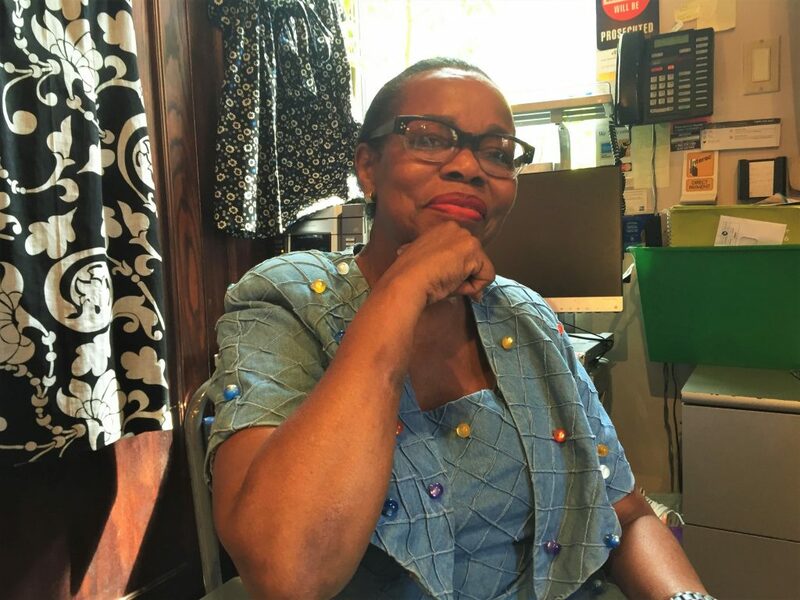 This invisible army is part of the shop’s unique approach to customer service: when you try on a dress, Pearl shows you how she’ll do the alterations so that it fits just right on your body. I ask how she comes up with her designs. Unlike many designers, Pearl looks for the fabric first before making sketches. “You have to fall in love with the fabric. You have to really like it… to know what to do with it” she says. Often, she doesn’t know what to make out of a fabric she loves, but will wake up in the middle of the night with an idea and start sketching. She shows me a photo of a dress she made for an AIDS benefit years ago: a mostly see-through creation made of black chiffon with hoops and taping for structure. She tells me the fabric was a challenge at first, but after letting her mind wander, while waiting for a doctor’s appointment, she rushed back with inspiration and started sketching with her pattern-maker. 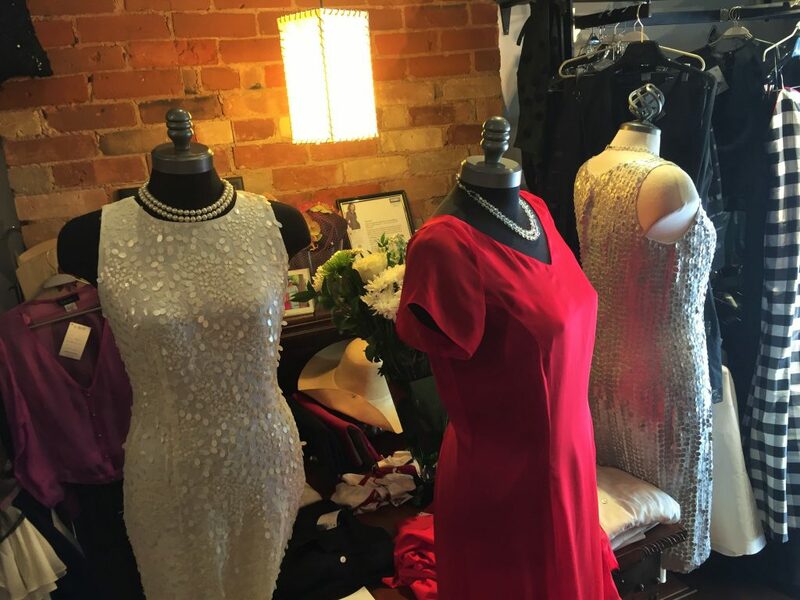 Pearl has participated in many charity events: from multiple benefits for people living with HIV/AIDS to a fashion show for domestic abuse survivors. 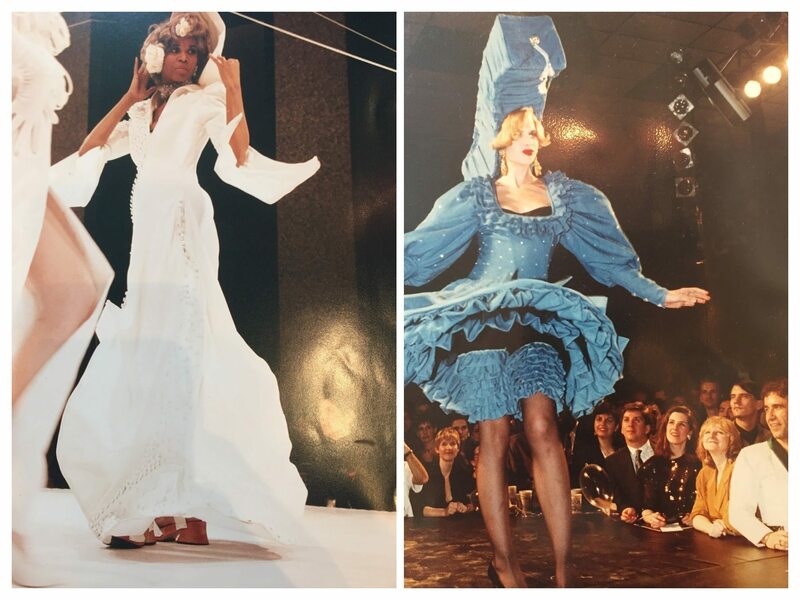 She shows me some of her creations from the early 90’s: a flowing white dress and an absolutely bonkers all-denim dress with a ruffled, hooped skirt and a hat that is almost indescribable (and probably just as difficult to wear). I keep trying to ask questions that will help me explain how inspiring I find her story to be, but Pearl isn’t having it—she talks as if coming from Jamaica to Canada and starting a business, as a mother of two, mid-life is just something you wake up in the morning and do, so I try a different approach. What advice would she give to other aspiring small business owners? I ask Marcia, the lady on the floor, who has been joining in the interview and sharing our laughs and photos, if Pearl is a tough boss. “Um… I don’t really work here” she says with a laugh. “I’m just helping.” “But am I tough?” Pearl asks her. “Tell the truth!” “No, no she’s not…” she answers, which elicits a laugh from Pearl. “Well, I don’t think that’s what you say sometimes!” They both burst out laughing. “I am tactful” Pearl says, “but I expect people to perform. I expect a good day’s work for what they’re paid. But if I give them something to do, I’m not going to be over them all of the time.” She likes to treat her staff well, and be kind with criticism. Before I leave, I ask her if she has anything in the store that reminds her of growing up in Jamaica. She shows me an old sewing machine on a front shelf that a customer gave to her. She tells me that her mother made clothes for her whole family on a machine that looks like this—for her, for her seven sisters, and for her two brothers—ten children in total. At the beginning of the interview, she had told me that her family was very close-knit. Her store has created a kind of family as well, with a house on 13 Charles Street West. 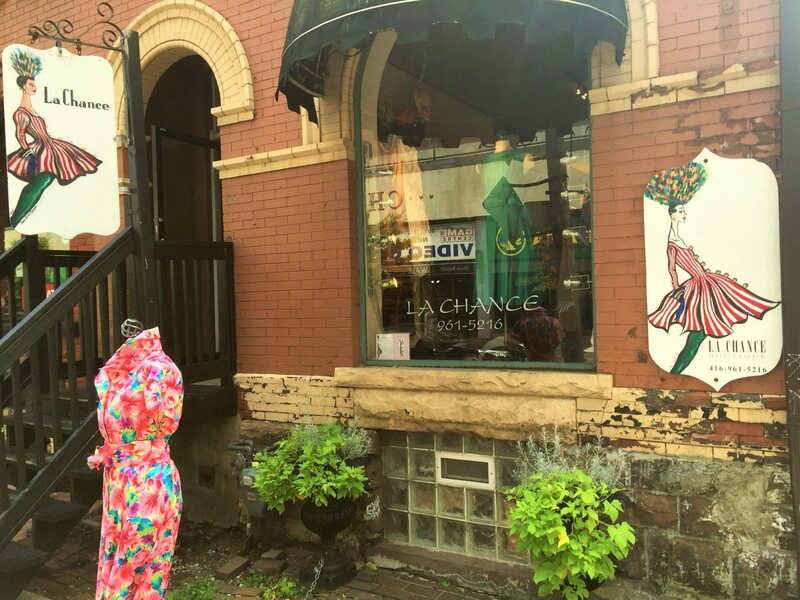 If you visit, she will find you something unique and beautiful to wear that will last for decades. You will feel at home. 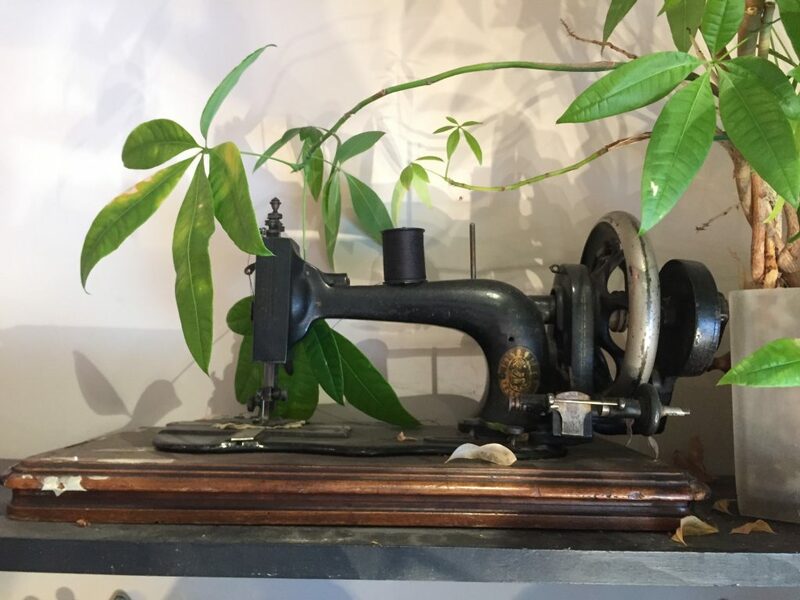 Pearl’s mother used to make clothes for her whole family of 10 children using a machine like this one. According to Pearl, her mother later got a foot-pedal operated machine, which she really liked.